Updated Tuesday February 19, 2019 by Trabuco Canyon Little League. 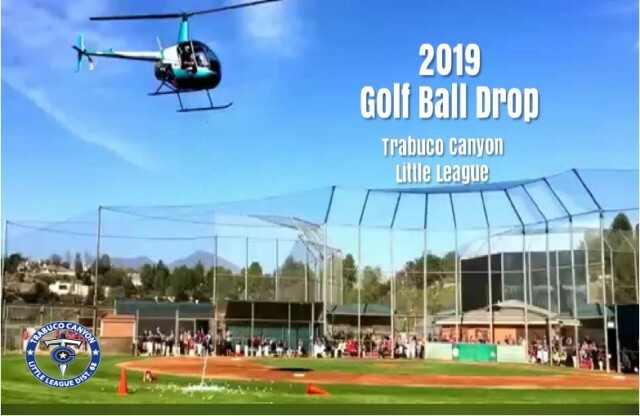 Trabuco Canyon Little League will be hosting its 5th ANNUAL HELICOPTER GOLF BALL DROP Donate Here!! The numbered golf ball that goes into the bottom of the hole first wins 10% of the proceeds from the Helicopter Golf Ball Drop, up to $2,500! If a golf ball does not go into the hole, then the ball closest to the hole wins. In the event of a tie, the prize money will be split equally among all of the tied golf balls. The winner will be announced that day. The winner does not need to be present to win. The Golf Ball Drop is a fun and exciting way for everyone to support TCLL. To accomplish our goals, we are asking each team to sell a minimum of 50 golf balls. If we reach this goal, THE GREAT GOLF BALL DROP - 2019 will allow TCLL to continue to provide quality facilities for all of our children. This is where we are counting on YOUR help!!! TICKETS ARE ONLY $10 AND WE ARE COUNTING ON EACH FAMILY TO SELL A MINIMUM OF 5 TICKETS. We've created a website to make it fun and easy for everyone to support our tournament. Each player has their own fundraising page that they can share via email and social networking to sell Great Golf Ball Drop Tickets! The website tracks everything so you can monitor your progress! Please visit www.tcll.accelraising.com to purchase your golf balls today!